In 1792, at the age of just 21, he went into a brief partnership with William Frisbee. This would be the first time the young silversmith would register a mark. The partnership was short lived and in 1793 he registered a new mark ‘ PS ‘ which was to become the mark he would continue to use throughout his career with only minor variations. His time with Andrew Fogelberg was to influence his style and he worked in the neo-classical manner along with many of his contemporaries. Having gained a reputation with his style and skill he was able to open his own workshop in London in 1796. George III Sterling Silver Salver. Click here to view on our website. Owing to his success, in 1807 he was approached by Rundell and Bridge, the Royal Goldsmiths, who requested he sell his works mostly through their prestigious London shop. Paul Storr agreed to this partnership altering his style and becoming more elaborate, in order to cater to the tastes of the shops wealthy customers. A handsome six-bottle glass and silver cruet set. Click here to view on our website. With patrons clamoring to obtain his work he soon gained an international reputation which was acknowledged by the firm, who made him partner in 1811. In 1819 Paul left the firm and became freelance. This would allow him the freedom to explore the more natural forms of the Rococo movement, which was experiencing a comeback. Sterling silver kettle by Paul Storr, hallmarked 1832. Click here to view on our website. Paul Storr’s independence was brief, as three years later, he went into partnership with retailer John Mortimer and became Storr & Mortimer with a shop on London’s fashionable Bond Street. Paul was to remain in this partnership until his retirement in 1838. Today, Paul Storr’s work endures because of his exceptional technique and attention to detail. He was a silversmith with a true understanding of the material he was using and an ability to turn an idea into a beautiful and lasting piece. Distinctive hallmarks of the above silver kettle. His pieces are to be found today in some of the most important buildings throughout the world. His work is on display at the Victoria & Albert, the British Museum and St. Pauls Cathedral in London and stately homes throughout to country. His silverware also graces the table of many royal households worldwide. The V&A Museum; Room 71: Huguenot, Regency and Virtuoso Silver. Image via. You will also find his works at the Met in New York. They can be seen at museums in Boston, San Francisco, New Orleans and beyond. 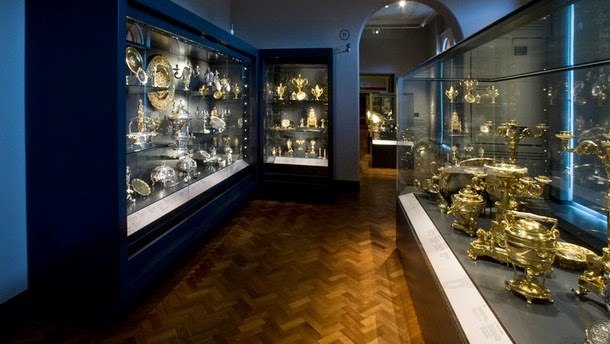 In fact, such is his importance, any museum which has a silver collection will undoubtedly have something made by Paul Storr. As well as public displays, his work has found its way into the homes of private collectors from around the globe, who are keen to be the appreciative owners of such rare and beautiful works by one of the most influential craftsman of all times. Here at I. Franks we are proud to hold several fine examples of his work, some of which you can view and purchase through our website or in our shops.